A new member in the family, especially a newborn, is definitely going to fill the air with excitement. As a soon-to-be mom, you must be excited to begin one of the most wonderful phases of your life. You would also be eager to break the news to your loved ones. If you are trying to figure out the best way to announce your pregnancy, this MomJunction post is for you. We have created a list of creative and funny pregnancy announcement ideas to surprise your husband, family, and friends. Also, we tell you when the time is right to reveal the big news. Your husband should be the first person to know that you are pregnant. So, tell him as soon as you know it. However, you can wait a while before telling the others, such as your family and close friends. Most women wait until they cross the 12-week mark, or until after the first trimester when the risk of miscarriage is less. You can also do it after 20 weeks when you come to know in the ultrasound that everything is normal. And once you are ready, you can announce your pregnancy to the world in style! Keep reading to check out some amazing pregnancy announcement ideas. A big cake: Order your husband’s favorite cake and write a message on it. Something like ‘We’re having a baby!’, ‘I love you, dad’ or ‘Boy or girl?’ can make it a pleasant surprise. You can also invite your family members and make it a small family event. Fancy and customized locket: You can get a locket for your husband with ‘Dad’ or ‘Baby’ or baby feet and gift him. It could be such a pleasant surprise, he might even scream in joy! News on the wall: Invite all your near and dear ones to a party. Paint a wall with the lines ‘It’s a baby boy/girl!’ to disclose the news in an interesting way. You could also use wall stickers if you do not want to paint. Double the fun: Let your husband take your snap while you are enjoying a good meal. At the bottom of the picture, add a phrase ‘eating for two’. You can either share this image with your friends and relatives or just put it as your social media status. Simple and clear. Double surprise: The above idea can be applied to twin pregnancy too. However, the text on the picture can be changed to ‘eating for three’. It would be a double surprise for everyone. A coffee cup idea: Order everyone’s favorite coffee and write the relationship name with the new member of the family. For instance, ‘mommy,’ ‘daddy,’ ‘grandpa,’ ‘grandma,’ or ‘uncle’. Easter eggs: Buy some Easter eggs, paint them in bright colors, and write ‘hatching soon’ on them. Send these tiny eggs as a surprise to your family members and let them know about a new member in the family. Flier news: This pregnancy idea is especially for grandparents. Create a flier with messages such as ‘See you soon grandma and grandpa,’ or ‘Hey grandparents, I’m coming home,’ or ‘I love my grandparents’ and contact their paper boy to put this creatively inside the newspaper. Quite a unique idea! Scrabble idea: This is for your husband. Start playing scrabble with your husband and make words such as ‘dad,’ ‘baby,’ ‘coming soon,’ and so on. See if your husband can figure it out or not. This can be an exciting way to announce the pregnancy news. Tiny baby shoes: These are cute, aren’t they? Take a snap of three pairs of shoes: mom’s, dad’s, and the little one’s. Share this beautiful image with all your loved ones and get ready to hear from everyone. Sonogram image: Send an envelope, with a sonogram picture inside, to your parents and in-laws. You can also take pictures of you and your husband, along with the snap of the sonogram result. Sonogram image with your dog: There are plenty of ways to announce pregnancy with your pet. One interesting idea is to click a picture of your pet with the sonogram image around its neck. You can also add a phrase on it such as ‘Ready to welcome his baby brother/ sister or the new family member,’ or ‘New entry coming soon’. Pregnancy announcement cards: It is easy to find fancy announcement cards that you can send to your friends. You can customize it with your own message, and even add the due date on the cards. ‘Coming soon’ messages: You can either create snaps with ‘coming soon’ mentioned over it or just send ‘Baby coming soon’ cards to your loved ones. Either way, they will be happily surprised. Movie idea: If your family members are movie buffs, announce your pregnancy in a unique style. A creative movie poster with ‘Coming soon in 9 months’ or ‘Releasing on (due date)’ would be pretty exclusive. A wine bottle: You can gift your friends a bottle of wine with a label saying ‘Please drink for me, I’ll join after (due date)’. This would be an interesting pregnancy announcement idea that you can try with your closest girlfriends. Funny stickers: You can create some funny and attractive stickers and put them on your doors or cars. It is a unique way to announce the pregnancy to your friends and neighbors. A chalkboard idea: Announcing pregnancy with a chalkboard is also a good idea. You can write any personalized message on the board and keep it in your living place so that anyone visiting your home would notice. Party with colorful balloons: Invite your family and friends to your home filled with balloons. Write messages on a few balloons such as ‘We’re having a baby,’ or ‘Baby coming soon’ and tell everyone to find it out. This is one baby announcement idea that everyone will love. Greeting cards: If you are a techie couple, you can make greeting cards with messages like ‘Baby is loading’ or ‘Baby in progress’ and send them to your close friends and relatives. It is a smart way to share the excitement. Baby is brewing snaps: Some interesting pictures can be shared with quotes such as ‘Baby is brewing’. You can have an image of coffee beans, a beer bottle, and anything that you seem matches the quote. Twin pregnancy news: Well, the above pregnancy idea is also suitable for twins. You can use intriguing images or cards or fliers and share the twin pregnancy news with all your loved ones. A guessing picture: You can play a game with your family members. Ask them riddles such as ‘Can’t wait to see our bundle of joy, guess who’s coming?’ or ‘Blue or pink fish, which one would you like to kiss?’ And let them guess. Baby shower party: Throwing a baby shower party is another birth announcement idea. You can host a party for your family, relatives, and friends and celebrate the arrival of a new member of the family. A cute illustration: A creative pregnancy announcement idea is to make an illustration with safety pins. Two big-sized safety pins representing mother and father, while a small-sized for a baby. You can add messages, images, drawings, and anything that seem creative. A beautiful poem: Do you write poetry? If yes, then what better way to announce a pregnancy than through a beautiful poem? Write a short poem in a greeting card and share it with the world. Surely, anyone receiving the card would be impressed with your clever birth announcement idea. Message in a bottle: One of the creative ways to announce a pregnancy is to write a message, put it in a bottle and send it to your family member. For instance, you can write ‘You’re going to be a dad,’ or ‘You’re going to be a grandma’. It is a beautiful idea to share such wonderful news. Third, fourth, or fifth baby: When you are excited to share the news of your third, fourth, or fifth baby, you can just make a collage of your kids along with one empty box as ‘coming soon’. Bun in the oven: You can use the ‘bun in the oven’ idiom as a funny pregnancy announcement idea. Either share a snap of the bun in the oven or send little buns with a message ‘enjoy this bun while the actual bun is in the oven’. Play with words to surprise your friends or relatives. Big sister message: You already have a girl and want to announce your second pregnancy to the world? Well, you can do it by involving your daughter. Let her write a message saying ‘I’m going to be the big sister’ or make a greeting with the same message and send it across on behalf of your little one. Big brother message: The same idea can be used if your first child is a boy. The message, however, would be ‘I’m going to be a big brother’. Let your kid know about the new addition in the family. Pregnancy confirmation: You can share a snap of the positive pregnancy test announcing the arrival of your baby. This could be an excellent idea to let the father of the baby,or only close friends and family know of the pregnancy. Personalized stickers: One of the creative ways to announce a pregnancy is by making customized stickers for your family members. For instance, ‘The doting grandma,’ ‘Loving grandpa,’ and ‘Funny uncle’. 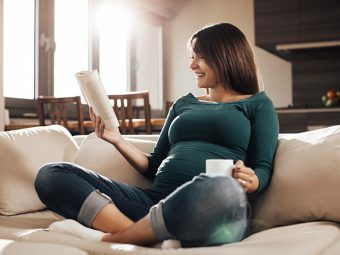 Gift a book: Wondering how to announce the pregnancy to your husband? Well, you can get home a book titled ‘How to be a good parent,’ or ‘Learning to be a good parent,’ or ‘How to be a good dad’. Keep this book on the coffee table and let your husband notice it. It would surely be a compelling way to break the news to the father. Pink color theme: If you are looking for a baby girl announcement idea, then you can choose pink colored greeting cards or posters or decor. You may or may not use the words ‘it’s a girl’ as people are likely to figure it out when they notice the color. Blue color theme: Use blue color invites and decorations for a ‘baby boy’ announcement. It is quite a simple yet creative idea to share the big news. Pumpkin idea: Little pumpkins can be your perfect messengers to share the pregnancy news. Take a picture of the pumpkin and add the due date. It is a simple pregnancy announcement idea that you can use. Baby bump idea: Invite your family and friends without giving them the slightest idea about what the celebration is about. Fix a signboard at the entrance of your house that says ‘Baby bump ahead’. Another baby bump idea: You and your husband could actually stand near the bump on the road, and get a snap taken. It is a personalized idea for the quote ‘Baby bump ahead’. Try that and see. Simple math: Another pregnancy announcement idea is using an equation through pictures, like 50% mom + 50% dad = coming soon. Greeting cards: For an easy pregnancy announcement idea, you can just make fliers or cards saying ‘We’re expecting’ and share it with your friends and relatives. Messages: ‘We’re halfway there!’ is also a thoughtful message that you can write on the cards and share with your family and friends when inviting them for a baby shower. List of baby names: Share a list of baby names with your family and ask them to choose one. It is a simple yet beautiful way to announce the pregnancy! Create a grocery list: One of the interesting ways to announce the pregnancy to your husband is by making a grocery list. Are you confused? Well, don’t be. Create a list of ingredients such as baby potatoes, baby carrots, baby milk, and so on, highlighting the word ‘baby’. Quite a surprise, isn’t it? Beautiful posters: Looking for more pregnancy ideas for grandparents? Create posters for grandparents like ‘Only the best dads get promoted to grandpa,’ or ‘Only the best moms get promoted to grandma’ and stick on the walls of their room. That would be a sweet surprise for them. Fortune cookies: Here is a beautiful idea if you can make fortune cookies. You can write messages such as ‘It’s a baby,’ or ‘It’s a boy,’ or ‘It’s a girl’ and hide them in the fortune cookies. Invite your family members for a small get-together party and distribute the cookies and surprise everyone. Festive announcement: You can announce your pregnancy during special occasions such as Christmas and New Year. That would undoubtedly call for double celebration. A pair of socks: Gift a couple of cute pair of baby socks to your husband or hang it on the wall in your bedroom. This baby announcement idea would be a sweet surprise for your beloved. Travel announcement: Does your husband love to travel? You can go to a romantic place such as a beach and then tell him that he is soon going to be a daddy. Or you can write it on the sand and surprise him. Delicious cakes: Get customized cupcakes with tiny shoes on it, or ‘Baby’ written on it. Distribute them among your relatives and friends. A cute and sweet surprise for all! A puzzle: Here’s a clever pregnancy announcement idea for your husband. You can have a customized puzzle game for your husband. Get ‘We’re having a baby’ or ‘You’re going to be a daddy’ written on it. Lego idea: If your family is a Lego fan, then you can use Lego toys in creative ways to announce the pregnancy. Picture of toys: This is a cute pregnancy announcement idea. You can take a picture of baby toys and share it among your family and friends. There is no need to write a message, as this picture would say it all. Countdown announcement: Take a snap of your baby bump along with a countdown sign and share it with your family and friends. You can use a calendar or an hourglass as a prop too. Baby laundry: Another picture of baby laundry hanging on a rope is also an interesting pregnancy announcement idea. You can share such pictures on your social media pages too. Scratch cards: You can buy scratch cards with hidden messages such as ‘Baby on board,’ or ‘Be ready to welcome a new family member’. And mail it to your friends and family members. This would be an interesting way to reveal the news. You can use one or more ways and be as creative and funny as you can. Whichever pregnancy announcement idea you choose, make sure to capture the happy faces of your loved ones. Turn these moments into special memories for life. Cherish the beginning of the beautiful phase of parenthood! Do you have any more ideas to announce a pregnancy? Share with us in the comment section below.